Every pregnant woman will ‘do’ the activity of giving birth some place or other. You might birth where you want or where you don’t. All around you, inside and outside where you birth, life will go on. What happens to you and around you in the place you birth will impact you more if you lack good birth skills. With birth skills you’ll feel assured of your ability to work with and around everything that takes place where you birth. Call us today! We look forward to working with you and to welcoming your new baby into the world with you. In hospital care, it is typical to have appointments that last only a few minutes, with little time to settle in and ask your questions. Often, prenatal visits focus on checking for what might go wrong and what tests and procedures you can expect for the month of pregnancy you are in. There is little time to get to know the people who will attend you in birth, and it is common to only see each provider once or twice during your pregnancy. But you know – and we agree with you – that pregnancy itself is an important and exciting experience that deserves attention and time from those who care for you. Pregnancy is a time to build your confidence and prepare you for the birth you want to have. First Visit – Once you decide to have your care at the center, we will schedule your first regular prenatal visit. You will be invited to our online system, to provide information about yourself and your health history. Your first visit is designed to be a comfortable experience for you – you keep all of your clothes on! In addition to talking with your midwife, if you are 12+ weeks along, you will be able to hear your baby’s heartbeat – likely for the first time! Your midwife will take your blood pressure, feel your abdomen, and check your urine for protein and sugar. You will be given a lab slip for your first blood work, which outlines your blood type, whether you are anemic and several other markers that will be explained to you. In discussion with your midwife, you can choose testing for STDs and if needed, a pelvic exam and pap smear. You will also be given information about your options for prenatal genetic testing, and ample time to discuss whether that is something you want to choose. We always share lab results with you. Schedule of Other Visits – As with any maternity care provider, you will see your midwife every month until you are 28 weeks pregnant. It then increases to every other week until you are 36 weeks along, then finally every week until your baby is born. Of course, we highly encourage you to include your partner in these visits, and you are most welcome to invite family members, friends or support people to any of your visits. There are also toys and a play space at the center if you would like to bring along your other children. At the Monadnock Birth Center we spend plenty of time getting to know you in the months leading up to your birth. Our Midwives help you prepare, starting from your first visit and aide you in deciding about the birth you and your family want to have. Your midwife will talk with you about diet and your lifestyle and provide you with the necessary information to make choices for keeping you and your baby safe and healthy. How you eat might just be the most important thing you can do for yourself and your baby. Whatever your diet preferences, we can help you achieve a great pregnancy diet and a personal exercise plan. You will have access to an exclusive online library of information about your pregnancy. In our care, we don’t assume anything. We provide you with information and then help you make choices that are right and best for you. We can help you develop a personal birth plan. Referrals to area prenatal exercise classes including yoga, prenatal water aerobics and prenatal dance classes; as well as to area practitioners: massage, chiropractic, acupuncture, natural medicine physicians and more. Childbirth classes are offered by area midwives. These are not typical hospital birth classes, but are designed to inform and engage you, your partner and any support people you choose, so that you feel confident and ready for your birth experience. The Birthing From Within method informs these specially designed classes. What if I need to see a doctor during my pregnancy? The Birth Center and our Midwives have excellent consulting relationships with the obstetricians at Cheshire Medical Center in Keene. Although typically, you will only see the Midwife at the Birth Center during your pregnancy, if the need arises, we can consult with these physicians and arrange appointments for you, and often we are able to accompany you to these visits. What if I have Questions or Need to Speak with a Midwife? If your call is non-urgent or about rescheduling an appointment, you can call either the Birth Center or your Midwife directly and she will get back to you as soon as possible. If your question or concern is urgent, a Midwife is on-call and available to you at all times. While we do not require routine ultrasounds, we make these available to you if you desire or if a condition arises that warrants an ultrasound. At the Birth Center, your midwife is always on-call to answer your questions and concerns in early labor while you are still at home. She greets you as you arrive in labor and remains your caregiver throughout your entire labor and birth. 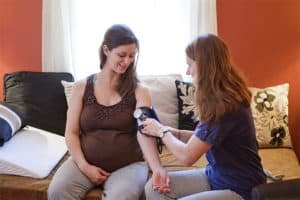 She is assisted by another midwife so that there are two providers for you and your baby, and in a long labor, these midwives sometimes take turns providing you with direct care; but there are no personnel shifts or changes – your midwives remain your midwives throughout your time at the birth center. With hospital care, your doctor or midwife is the one on-call when you go into labor. If your labor lasts longer than one personnel shift, staff changes can mean that the provider who cares for you during labor is not the same as the provider who is with you when you give birth. For much of the time you are in labor, nursing staff provides most of your care, and frequently you see your doctor or midwife periodically. The personal care you receive at the Birth Center will be of great benefit to you and will support you to have the experience you are looking for. You will have a beautiful, comfortable suite, with a queen-sized bed, places to sit and rest, plenty of room to walk and move around in privacy, and your own bathroom and birth pool. Your support people have access to a living room and kitchen as well. Your midwives will provide you with care – including regularly monitoring your health and the well-being of your baby – as well as emotional support and guidance. There is plenty of room for your partner – whether on the bed with you, walking around with you, or sitting beside the birth tub with you. The birth center provides simple nourishment for you, and you are welcome and encouraged to bring food and drink of your choice with you as well, for both you and your partner and support people. The majority of women who labor at the birth center make use of the birth tub and find it a comforting and supportive experience, with many women choosing to give birth in the tub as well. We provide natural comfort measures for you, including emotional support, hypnosis for labor, massage, birthing balls, a birth stool, and nitrous oxide – a safe option for pain relief – is available. Your midwives will encourage and support you to give birth in the position and the place in the room that works best for you. At all times, your midwives will be monitoring and keeping a close watch on the health of you and of your baby, throughout your labor and birth. What if I need to go to the hospital during labor? If you and your midwife decide you develop a need for the care of an obstetrician during labor, the midwife will reach the doctor on call at Cheshire Medical Center to let them know that we will be bringing you to them for care. The vast majority of the time, transfers to the hospital are not emergencies, and most of the time the midwife and family go to the hospital in cars. The birth center and our midwives have excellent relationships with the doctors at Cheshire Medical Center, and transfers of care go smoothly and comfortably. Your midwife will always accompany you to the hospital and remain a key support person for you until your baby is born. In the rare instance of an urgent transfer, the birth center has a relationship with the ambulance service in Keene who send an ambulance to make the transfer to the hospital. The midwife will accompany you in the ambulance and your partner and any other support people accompany you in your car. From research we know that a woman’s feeling of safety, comfort and support during pregnancy, labor and birth contributes significantly to her ability to give birth naturally, and to move confidently into parenting her child. This is one of the most common and important questions that people ask who are considering care at a birth center. Although 60-80% of women having babies in Europe have care with a midwife, there are many misconceptions about the safety of birth centers because the majority of women in the U.S. have maternity care at a hospital with an obstetrician. Interestingly, the most common reason that women give for choosing choose either hospital care or birth center care is that their choice is where they feel safest. At the Monandock Birth Center, we believe that every woman should give birth where she feels safest, wherever that may be. We are always prepared to have in-depth discussions with you, at the beginning and throughout care, to support you to choose the place for your birth that brings you the most comfort, peace of mind and sense of confidence. We encourage you to research your options and to choose carefully and thoughtfully, and we look forward to talking with you and your family about issues of place of birth and safety at any time. As soon as your baby is born, you will be able to hold your baby, while your midwives will help you deliver your placenta and begin to breastfeed your baby, providing you with the care you need while also protecting this precious time and space for you to greet and get to know your new little baby. During the several hours after your birth, your and your baby’s health will be closely monitored. We will support you to get off to a good start with breastfeeding, do a physical examination for the baby, feed you and your family, help you take a refreshing shower, and allow you time for rest. We will report the birth to the state vital statistics office and begin the process for the birth certificate, and give you information about caring for yourself and your baby once you arrive home. After several hours – usually 4-6 hours after your birth – we will help you pack up to go home. While in hospital care, you would stay for 24 hours or more, in our care you go home to rest and be with your baby in the comfort of your own home. We then visit you three times in the first week after your birth – the next day, on the third day and at one week. During these visits we provide you with information on baby care, support for breastfeeding, and make sure you and your baby are healthy and recovering well. These visits and our focus on support for you after the birth are distinguishing hallmarks of our care. We know how important it is for you to have this support to get off to a great start in caring for your baby, and for you comfort, confidence and well-being. After these home visits, we also see you and your baby for check-ins/check-ups at 3 and 6 weeks in the office. During these visits, we continue to provide you with both care and support as you continue your new journey of parenting. The Monadnock Birth Center and our midwives are in-network providers with most major insurance plans – including Medicaid. If you decide to have care with us, our billing service will check in with your insurance company and provide you with a report that lets you know exactly how your plan will pay, including any out-of-pocket expenses you can expect to owe. Your plan will pay just as it would at the hospital, including any deductibles or co-insurance. If you do have co-insurance, you can expect your out-of-pocket expenses to be less than they would be at the hospital, as our charges are significantly less than hospital care. If you do not have insurance, we will help you explore your options to become insured; if you continue to not carry insurance, we will work out a payment plan with you.